How many programs does it take to change a youth group? That question has bothered youth workers for decades, and the cracks in its logic are beginning to show. In place of the contrived, artificial mechanisms employed so widely in modern youth outreach and discipleship, Mike King proposes a ministry centered in the presence of God. Young people encounter Christ not in the flash and pop of arena ministry, but in the sacred shadow of his presence. They learn what it is to love and follow Christ by observing others loving and following Christ--letting Christ shape their worldviews, their habits, their virtues. Presence-Centered Youth Ministry gives shape to such ministry through the classic disciplines and potent symbols and practices that have sustained the church over the centuries. The sound and fury that has characterized youth ministry for so long has left too many youth workers tired and too many young people disillusioned. Come explore the deeper terrain; your students are sure to follow. "Wow. Talk about stirring the pot! Mike King gets way out on some beautiful and truthful thin ice, naming many of the closely held wrong assumptions and faulty practices of modern youth ministry. Then he crosses to the other side of this thin ice, and suggests a path forward. Congrats to Mike, and to anyone willing to thoughtfully consider the ideas in this book!" "Mike King has started a conversation that's long overdue and frequently ignored in youth ministry circles. In this thoughtful book he tells his own story with humble vulnerability, exposes the sacred cows we've let graze for far too long on the youth ministry landscape, and helps us see that ministry isn't about facilitating and teaching outward behavorial conformity. I'm sure this book will make many uncomfortable because of its subject and recommendations. Pick it up. Don't put it down. Prayerfully wrestle with Mike and his message. Keep reading. This book just might take you out of your comfort zone, but that's right where many of us need to be led in order to be able to carefully and faithfully lead young people into the life-changing presence of God." "Make no mistake: Presence-Centered Youth Ministry is about God's presence, not ours--which right away puts Mike King's approach to youth ministry in a class of its own. King transcends 'liberal/conservative' stereotypes by putting ancient spiritual practices at the heart of our ministry with young people--practices that center us in the presence of God. If you're not won by the teenagers you meet in these pages, you'll be won by the glimpses of how King's own ministry helps youth 'practice the presence of God.' If Brother Lawrence had been a youth pastor, this book would have been his favorite resource." "With Presence-Centered Youth Ministry, Mike King has given us a road map to the tectonic shift underway in student ministry. At turns personal, challenging, testimonial and prophetic, this book will surely capture the hearts of many youth workers. Mike speaks from experience, yet with humility, and he is truly setting the course for a new day in youth ministry." Whether a person has been working with youth for years or is trying to decide whether to lead a group for the first time, he or she will discover in this book an approach to helping young people mature spiritually. Mike King is old enough to have washed ashore with all the trends in the last 40 years or so in evangelicalism. He's tired of the programs and the catchy theories. He calls us back to the center, to knowing God, to being known by God, and living - and ministering to youth - out of that knowing and being known. With pastors like Mike King we've got glimpses of changes that will speak the gospel into the next generation. 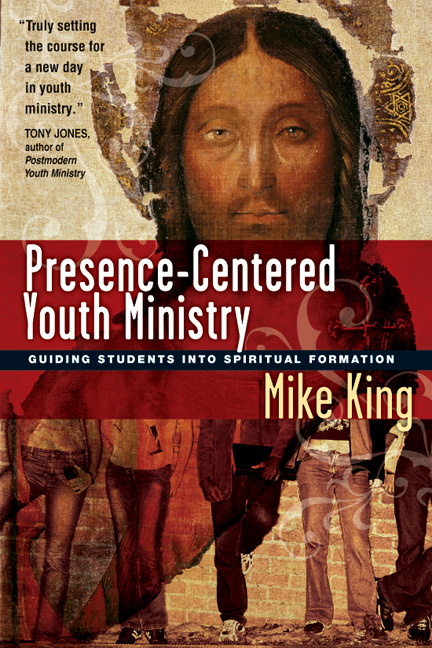 Presence-Centered Youth Ministry is an excellent supplemental text useful for challenging some long-standing youth ministry thinking and practice. . . . his larger contribution may be in naming the specific task of youth ministers as bringing youth into the presence of God. This book has great value. Highly recommended! Though the job of youth ministers is challenging, this book?s easy-to-read format offers suggestions and solutions for them that are both theoretical and pragmatic. Conclusion: Where Are You Staying? Visit the YouthFront website for more information. Mike King serves as president of Youthfront, an organization creating environments for youth to experience spiritual transformation, and providing support to churches and youth workers. Mike also serves on the pastoral staff of Jacob's Well Church in Kansas City, Missouri, and is a frequent speaker at conferences and conventions. He and his wife, Vicki, have two sons, a daughter, and two daughters-in-law.